Pity the wheat. These days, it gets a bad rap: mass-produced, too much gluten, too many additives. But in downtown Lynn, childhood friends Jon Olinto and Tony Rosenfeld are going against the grain with One Mighty Mill. They want to make wheat — packed with fiber, freshly milled, produced daily — rise again. And so it is that I’m standing in front of a sleek black cafe, watching wheat berries cascade into a granite hopper to be transformed into flour. Behind that, bakers huddle before a gaping oven. Two older men hold court outside on electric-blue chairs, trading jokes over coffee. I step inside. Congressman Seth Moulton’s district director, Rick Jakious, does business in one corner of the cafe while munching. Artist Al Wilson, responsible for many of Lynn’s downtown murals and neon art installations, ambles in for a cup of coffee and sits down with him. 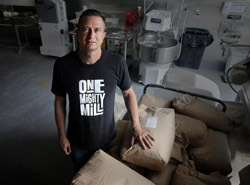 Cofounder Jon Olinto at One Mighty Mill in Lynn. Meanwhile, I’m trying to decide between a bagel with almond butter or avocado and sea salt. No, this is not your great-grandfather’s mill. Cofounders Olinto and Rosenfeld opened here in early September after moving on from their first endeavor, healthy franchise b. good, where they served oven-baked fries and all-natural burgers. B. good listed fat content and calorie count on menus. Billboards on the walls spotlighted their farmers. The pair were early proponents of the farm-to-table movement when they opened their first all-natural, fast-casual shop on Dartmouth Street in the South End almost 15 years ago — long before Dig Inn or Sweetgreen came to town. Now they want to do the same for bagels. Olinto has the wiry build of an athlete and the kinetic energy of a highly caffeinated entrepreneur. (I have never met anyone who responds to text messages so quickly.) He conceived the idea during a wheat-focused midlife crisis, during which he needed to try something new. B. good was successful, and he wanted a new challenge. He attended a food conference in Maine, where he met Matt and Sara Williams. The organic, pesticide-free farmers run Aurora Mills & Farm in Linneus, Maine, close to the Canadian border. And he realized that there are very few organic wheat farmers left in the Northeast, let alone in the United States. “Once, every community in America had a mill. Every farm used to grow grain. I didn’t know anything about that, and it was enough to say, ‘I want to figure it out,’ ” he says. Olinto says that flour was once a cornerstone of our economy — but that industrially processed flour, stripped of nutrient-rich germ and bran, usurped those mills. And nobody was recapturing the market. Why not him? He began to chronicle his idea in a personal blog. “What I discovered is that nobody in the whole-grain industry is using fresh milling and farm-to-table to convey their value. They can’t. They’re all captive to the same industrial supply chain,” he wrote. Today, a mission statement is printed on Mighty Mill’s window: “wheat you can eat,” milled as in days of yore. This means stone-grinding wheat into flour daily, on-site, fully visible to the public, without fillers. The pair work directly with Aurora. Their mighty mill, adjacent to the cafe, was custom-made by Vermont mill-builder Andrew Heyn. Heyn is basically a unicorn in the wheat industry: one of a few millers using artisan-made, pre-Industrial Revolution equipment, deep in the woods outside of Wolcott, Vt. The Williams family tipped Olinto off about Heyn — the organic wheat industry is tight, after all — and Olinto vowed to track him down. But off the grid in the northern wilderness, Heyn never responded to Olinto’s calls. So Olinto took an impromptu four-hour drive from the South End to his remote headquarters, dodged an unfriendly dog in the driveway, knocked on his door, and asked him to build an old-fashioned mill. And, slowly, the business was born. The team rented space at the South End’s Cathedral High School, close to Olinto’s apartment, and tested recipes, cheered along by a nun named Nancy who runs their commercial kitchen. Olinto’s parents own fabric stores throughout the area, and he temporarily stashed wheat pallets from Maine in their Quincy warehouse. Olinto’s wife and sons were supportive but confused. “I’d make a starter at night, wake up early, and try to bake. They know I do weird stuff anyway, but this was exceptionally strange. Our kitchen was filled with big bags of flour,” he says. After scouring Boston neighborhoods for his mill, he settled on Lynn, a city as underappreciated as organic wheat. He was swayed by a friend of a friend who works for Moulton, who represents the city. Lynn officials convinced him that a mill, complete with a cafe, could serve as an anchor downtown. After fruitless searches in Boston, Olinto agreed. “Lynn is awesome. To be honest, they support us. The mayor comes in every day. Rick [Jakious] is there every day. It’s such a cool feeling! That idea of a mill being one of the central food centers of a downtown, you can build a real community around it,” he says. Mighty Mill offers a 15 percent neighborhood discount, and prices are already low: $1.49 for a bagel; $3.29 for a pretzel with mustard. Here, Olinto notes proudly, it’s possible to buy a discounted bagel with cream cheese more cheaply than at the neighborhood Dunkin’ Donuts. Olinto handles operations; Rosenfeld oversees baking. Today, he’s joined in the kitchen by an early b. good mentor, Steve Quinzani, from the old Quinzani’s bakery in the South End. “Any time we have a question, we just call him,” Rosenfeld says, laughing. “It’s like the b. good mafia.” Another b. good baker, Leonel Martinez, works nearby. Before founding b. good, Rosenfeld cooked at L’Espalier. Olinto has no formal baking experience and happily focuses on operations. He leaves the kitchen to chat with representatives from Roche Brothers — wholesale business is in the works — as Rosenfeld explains the finer elements of proper bagel-making. They do things differently here, Rosenfeld explains. He arrives at 4:30 a.m. and begins milling. Wheat is milled and sifted into three bins: flour, which is 85 percent of the yield; germ, which is 5 percent; and fiber-rich bran, which is 10 percent. Germ is the key, says Rosenfeld, and it’s often overlooked in the baking process. Most wheat is 14 to 15 percent gluten, the polarizing protein that gives bagels their spring but can also cause an inflammatory response for some people. Here, it’s just 10.5 percent. There are no additives or fillers to extend shelf life. The ground product smells earthier and feels coarser. At One Mighty Mill, the milling process takes two days. Wheat is sifted, mixed with water and yeast, and sits as preferment. It’s hand-formed and left to rest for another 24 hours in a proofer to rise, then baked off at 425 degrees for 24 minutes in a deck oven with steam features. “Most places have a bagel oven, but this is like having a Corvette for city driving,” Rosenfeld says. Steam imparts a signature chew otherwise conferred by gluten and helps form a glossy outer shell. Olinto and Rosenfeld have heard from customers who consider themselves gluten intolerant. Whereas some people simply can’t eat wheat, Rosenfeld believes that others just aren’t eating the good kind. “I’m certain the industrialization of our flour and wheat made it into junk food and all of this stuff our body isn’t intended to eat,” he says. One Mighty Mill’s products are already being served in seven Boston Public Schools with more to follow, part of a citywide push to serve healthier, fresh food. Olinto hopes that his own sons, who attend BPS, will soon eat his bagels in their cafeteria. “I don’t want to sound corny, but the goal isn’t just to make bagels,” Olinto says, holding court in the cafe, pausing to wave to another Lynn local who’s arrived for a morning fix. “We want to bring back local food systems to help our communities be healthy and thrive with this idea of wheat you can eat, revitalizing a local food system. If we’re successful, we’ll change people’s health, and we’ll restore a grain economy for farmers,” he says. I settle onto a chair with my double chile bagel, topped with avocado. The bagel is smaller and denser than my usual fare. It’s not springy or round. It’s earthy, nutty, and compact. After my visit, I call Rosenfeld and make a confession. My meal at One Mighty Mill was my first taste of wheat in two weeks. I’d been dealing with heartburn, and my mother-in-law suggested that I cut out gluten. I’d never felt so terrified biting into a bagel. “But how did you feel?” he asks.